COCOA BEACH, Florida -- It may be Green Monday today, but it was "Green Sunday" yesterday for beachgoers off Florida's Space Coast. 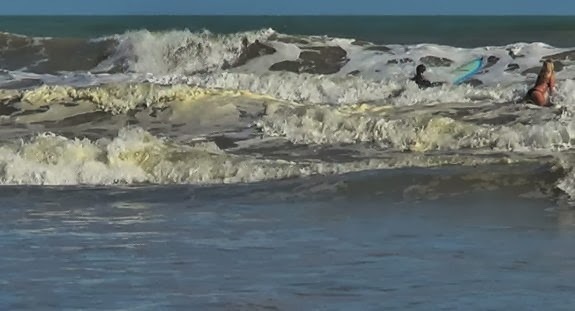 The surf turned to a bright fluorescent green Sunday afternoon as waves broke off Cocoa Beach, Florida. When surfers paddled out through the breaking waves, the water agitation appeared to make the surf even greener. In recent weeks, Brevard County beaches have accumulated heaps of seaweed due to prevailing easterly winds. Florida Fish and Wildlife officials stated that they will conduct sampling of the waters off Cocoa Beach and Cape Canaveral to determine whether an algal bloom is the cause of the water discoloration. Brevard County Environmental Health Director Melissa Brock said in an email that after FWC's test results are in, "a Florida Department of Health response will be based upon if a bloom exists and if the responsible organism produces a toxin that is harmful to health." The video is in High Definition. Select the video quality by clicking on the gear symbol in the video toolbar. If the viewer does not have high speed internet, the video should automatically appear in lower resolution to accommodate the lower internet speed.